J Walter Thompson South Asia appoints Raji Ramaswamy as the CEO of Contract Advertising with effect from July 3, 2017. She replaces Rana Barua as he moves out due to personal reasons. 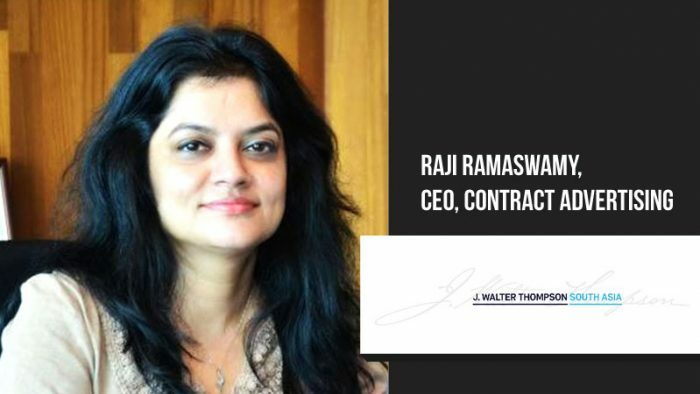 With over 25 years in marketing and brand management at J Walter Thomson, Raji is a seasoned communications professional with depth and width of experience. She is driven by all the opportunities in today’s communications landscape including digital, activation, design and integrated marketing. Over the years, she has worked with some of the most high profile companies and brands, in Mumbai and later in Kolkata, including Kellogg’s, DeBeers, ITC, Tata Steel, Berger Paints, Exide, to name a few. As the head of JWT Kolkata, she has led a large team to significant business wins and expanded the operations. She has been instrumental in nurturing a workplace that has a diverse pool of creative talent and capability. Under her leadership, JWT Kolkata has consistently had the leadership position in the region and continues to grow. Her key achievements are leading teams in Category Development, Strategic Planning, Brand Insights, Communication Development and Brand Management. Raji’s deep understanding of the business plays an important role in enabling her to orchestrate multidimensional brand solutions. Raji is a member of the Global Diversity and Inclusion Council at J Walter Thompson and a recipient of The Telegraph She Leadership Awards 2016. An avid reader of both fiction and non-fiction, Raji believes that life is all about learning. She loves nature, adventure sports and traveling too.